If you own a Samsung smartwatch, chances are its a Tizen-powered Gear device rather than its solitary Android Wear watch, the Gear Live. Whether its the brand new Samsung Gear S2 or the army of Gear models which preceded it, you'll want to know what to download from the 1,000+ apps available for its Gear smartwatches. Whatever Gear model you go for, make sure you download these 25 awesome apps to complete the package. Be sure to also check out our Samsung Gear 2 review, our Gear 2 Neo review and our guide to getting more from your Samsung smartwatch. The standard Gear music controller is OK but beatObox is the more complete solution. It's based on touch-based gesture controls that work anywhere on the screen rather than on discrete buttons. That means that you don't have to look at it while your fiddling with your tunes. It's also compatible with Spotify, Google Play Music and anything else you might be using. The final nail in the stock player's coffin is that beatObox simply looks far better. Go get it. Nokia's HERE maps (below) is good. Gear Navigator is better. The interface is superb and it also adds driving directions as well as the walking and cycling options to make it the complete mapping app at your wrist. It'll buzz you with turn-by-turn directions and even offers you a Street View too so that you know exactly what you're looking for. Too good to miss. Just like an in-car satnav, POI nearby will tell you about hotels, bank machines, restaurants, city sites and the like and then give you a hand in getting there. Powered by Nuance, it understands your voice commands, presents you with ratings for each listing and tops it all off with turn-by-turn navigation which will buzz you every time you need to change direction. A great tool for city breaks. We like Wearable Widgets a lot. So will you if you use any widgets on the homescreens of your Android mobile phone which, in all probability, is basically everyone. Wearable Widgets can mirror just about any piece of software gadgetry direct to your Samsung Gear smartwatch display. One quick glance at your wrist and you'll have all that information that you want, the way you like it presented and all without having to reach into your pocket. There's a good chance you don't use the stock Gear calendar app because, frankly, it's a bit flat. Instead, put your smartwatch forward an hour by trying out Calendar Gear Pro. It throws in a more flexible daily/monthly/detail view option plus the ability to add and hide all of the calendars that you subscribe to on your mobile phone. A more elegant calendar for a more civilized age. The trouble with all the very nice, very pretty list apps for Gear is that there's far too much tap-tap-tapping on a screen that's just too small. Fortunately, Speech2List has a very clever and finger-free way around the lack of voice support that most third party apps get faced with. Instead, you use the same program on your mobile by whizzing around your kitchen and speaking each item you need into the device. It will sync automatically and your voice-created shopping list appears nice and neat and ready to go on your smartwatch. The old ones are the best, and there have been tech watches with the ability to act as remote controls for any electronic items in the room around since the 90s. Remember that kid messing with the teacher's head when it came to working the video player? That can be you thanks to Power OFF and the IR emitter on your Samsung Gear smartwatch. All this one can do is turn gadgets off but it'll work for anything. Too cold in a restaurant - switch off the air-con; too noisy in the pub, silence the music. You get the picture. There are a lot of watch faces out there but the app to look out for is Watch Styler. It's a platform for a whole host of free and paid-for designs and, yes, you can even use it to create one of your own too. 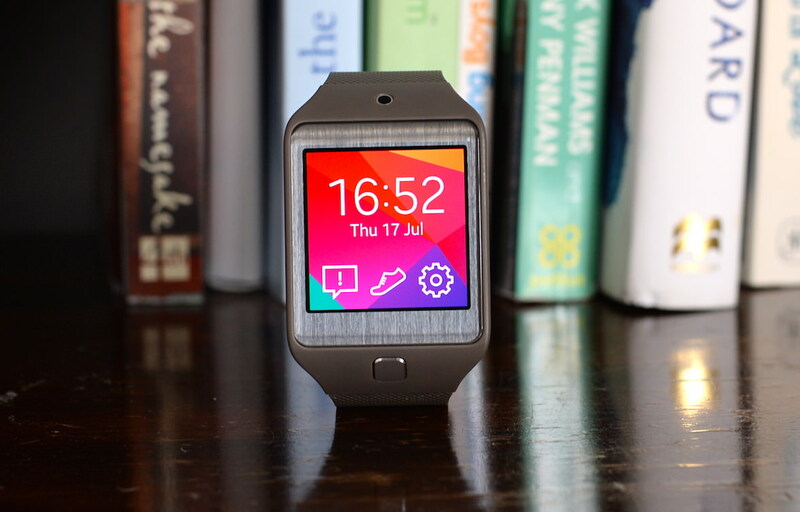 It can be a little tricky to find depending upon where you are and what app store you use but check both the Tizen catalogue as well as the Galaxy Gear Apps one too. After that, it's up to you whether you go for timepiece classic or wristwatch of the future. This app can be as silly or as serious as you need it to be. If you want to jump around your room thrashing out air guitar chords through your Gear's gesture control, then there's plenty of fun on offer. If instead, you're after a clever way of learning new songs and playing along to your favourite digital records, then it's got all that too. Customise, choose different guitars types, add lyrics, grab chord combinations from the internet; there's hours of fun in Solo Air - in fact, so much so you might even forget the utter fool you look like while using it. We've seen apps for mobile phones that match the speed of your running to the BPMs of your music collection but StepPlayer has the sense to bring it straight to your watch. After all, why run with your phone unless you have to? It keys into the more accurate movements of the accelerometer on your wrist and, after initial calibration, pumps out the sounds that'll keep you right in the zone. Nokia's HERE maps app is actually more polished than you might think, and certainly capable of challenging the Apple and Google equivalents. HERE is available for Tizen and offers turn-by-turn directions, offline map caching, phone-free operation and more. It's not just Nokia getting in on the Samsung Gear S action as Sammy tech giant has teamed up with Nike to offer the popular Nike+ Running app straight out of the box. The GPS radio of the Gear S means that you won't need to pair your smartphone to get in on the Nike+ Running fun as your new smartwatch can do all the tracking on-the-go. There's also a built-in music player within the app and your heart-rate can of course be monitored by the Gear S's optical sensor too. Already a popular running app, RunKeeper was one of the first fitness apps developed specifically for Gear, and syncs with your phone (if you have a Samsung, that is) and displays your calories, workout statistics and tags friends on your wrist. The audio cues are also integrated, so it can shout motivational cheers at you without headphones jangling in the middle. One of the winning entrants in the Samsung Gear App Challenge, SlideEasy lets you control slideshows set up on your phone from your wrist. You can use taps or hand gestures to go back and forth, and there's also the option to get an on-screen warning or a buzz when your time is running out on a particular slide. Trainr plugs into the sensors on your Galaxy Gear watch to provide a complete workout and fitness training solution. It can tell you when to start and stop your routines, help you improve your fitness over time, provide statistics on your progress and of course share your achievements with your friends. If you have a Gear watch with a camera, CameraAce helps you get the most out of it. Customised photo profiles (outdoors, indoors, HDR effects and so on), image slideshows (completely with music) and the option to automatically transfer pictures back to your phone are all handy features to have. Keeping track of expenses can be difficult while you're on the go but Budgit brings the necessary tools to your wrist for easy access. You can set a budget and make sure you don't exceed it, split spending into categories, and view a pie chart that shows where all of your money has disappeared to. EventSeeker helps you find gigs, shows and sport events in your current area, whether you're sat at home with nothing to do or away on holiday with friends. You can follow particular bands for updates, browse personalised recommendations, get reminders for ticket sales, and more. This is the top-rated app on the Samsung Gear devices right now, and it's not difficult to see why. You can get instant translations for 37 different languages by just speaking at your wrist — from understanding road signs to ordering food in a strange country, it's hugely helpful to have to hand. Paranoid parents and frequent group-trippers will love this app, which groups family and friends into categories and alerts you when someone reaches a particular location, such as when the kids arrive home. You can also make emergency calls and send pre-written texts, and call a Life Adviser if someone goes off the grid. Imagine you had someone to update you on the commute, track your deliveries and send texts to friends if you're going to be late for a scheduled meeting? We're not offering you a PA, but EasilyDo is pretty close. As well as all this, it can also send you alerts for important emails and updates you on whether you need to take an umbrella to work with you (chances are, you do). The hugely popular predictive keyboard has arrived for Gear, especially welcome considering the small screen and our big thumbs. Sometimes it's nigh on impossible to guess what we're typing, but Fleksy learns as it goes and does a pretty good job of correcting spelling and making general sense. Find out how your little bundle of joy is doing from your Samsung smartwatch with Baby Sitting. Your phone or tablet doubles up as the viewfinder so you can view a live stream from elsewhere in the house, and there's the option to set a certain noise limit at which point you get a vibration alert on your wrist. An app of two halves, Path serves as a private messaging service with people and groups you determine, with messages deleted after 24 hours, in which you can send texts and transfer files. It's also a news feed, where you can publish personal updates you only want certain people to see, updating them on your location, activity or mood. A bit like Facebook before they started spying on you. TripIt is an incredibly handy travel planner service that prides itself on being available on just about every platform out there, and that includes Tizen. With a flick of your wrist you can view departure times, hotel numbers, directions to the train station and more, all without having to put down your bags. In order to download the best new Tizen apps for your Samsung Galaxy Gear, Gear 2, Gear 2 Neo or Gear S smartwatch, you'll need to use the Samsung Apps portal on your smartphone instead of heading straight to Google Play as usual. A Samsung customer service person downloaded an app on to my Gearfit2, after which I was bale to read my emails on my watch. When everything got screwed up, I went back to get it set up again, the customer-service person was no longer there, and no one knew what app this might have been. Any help from anyone who reads your emails on a Gearfot2?